A cycle counter in Hackney is due to clock its 500,000th cyclist today (Thursday), just five months since its installation on August 6. Hackney Cyclists, the borough branch of the London Cycling Campaign, will be camped out beside the UK’s first digital cycle counter on Goldsmiths Row to give the 500,000th cyclist a prize. The council closed Goldsmiths Row to motor traffic in 2011, which now forms part of a major cycle commuter route from Hackney into the creative and technological hubs of Shoreditch and Old Street, as well as the City. The highest daily count so far was 5,825 on Tuesday August 20, and the lowest just 256 on New Year’s Day. Parsons added Goldsmiths Row also lies on an ancient drovers route, which today’s partially traffic-free cycle route follows for a mile North to Hackney Town Hall. Cattle once grazed in London Fields before heading to slaughter in Smithfields. 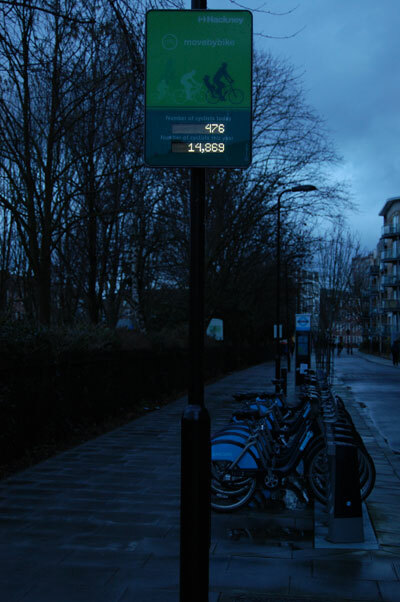 The counter zeroed on New Year’s Day after clocking up 484,710 cyclists since installation, so the 500,000th cyclist will be number 15,290 on the digital display. Brenda Puech, who organises breakfasts for Hackney Cyclists, will be waiting for the 500,000th cyclist. She says: “We are going to have a stand with our banner and we are going to give them a surprise gift – we will probably have gifts for the last ten or so cyclists.” She said the gift could be champagne or a bike tool kit. 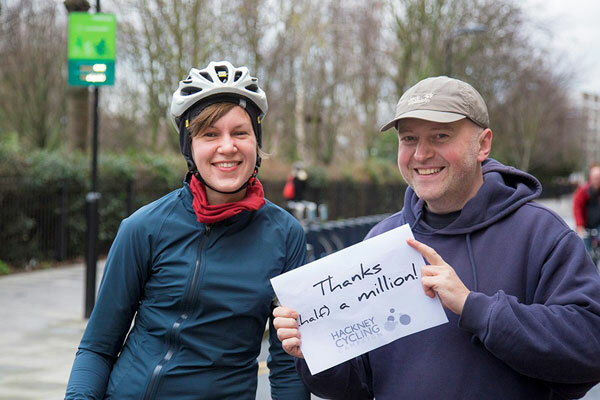 A Hackney Council spokesman, who predicted the counter will hit half a million on Thursday, said: “We installed the counter to highlight the actual number of cyclists on our streets and emphasise that it is a key mode of transport for large numbers of people in Hackney. The company producing the counter, Traffic Technology, will draw names from a hat from a competition which ran in early December to guess the date the counter would clock 500,000, with a £150 local bike shop voucher for the winner. The unit itself costs £2,500, or £5,000 with the logging equipment. Toomey says there has been interest from other councils, whom he hopes will compete for cycling infrastructure. Update: the cycle counter hit 500,000 in this morning’s rush hour.